The Department of Energy’s Loans Program Office needed to address and reassert control over the ongoing political narrative. LPO outreach efforts had been obstructed, obscured, and its ability to fulfill its Congressional mandate was in jeopardy. It needed to reinvent itself and reframe its outreach. Together, team NDi and LPO, conceptualized, created and executed a suite of new communications tools, a new web platform and a new public image. We coordinated with the DOE’s Office of External Affairs to produce and develop a monthly E-Newsletter—a periodic with general program updates, progress and achievements—as well as a quarterly update that provides in-depth program reports to industry and energy experts. We helped pivot LPO’s image in the mainstream media: we helped write, edit and publish a series of high-level white papers focused on LPO success and what their benefits mean for the US economy and US taxpayers. 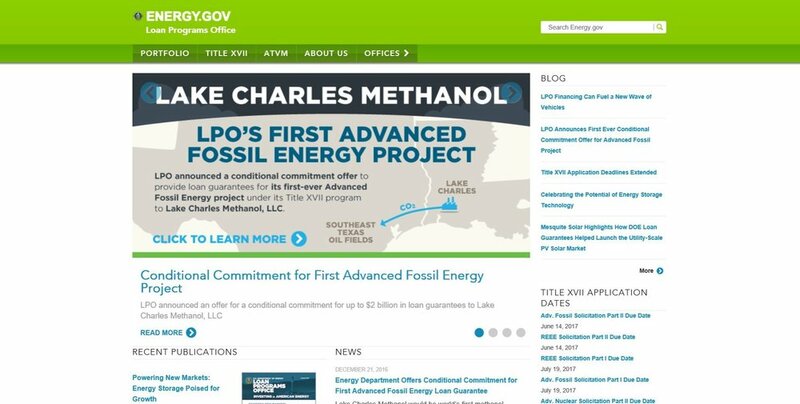 Additionally, we helped accelerate a complete overhaul of the new LPO website, collaborating with multiple DOE departments through a working group to migrate all information from the existing platform to the Department of Energy’s new agency-wide Drupal platform. We established a new brand, working with LPO to design, develop and deliver new taglines, talking points and a new image for the Loans Program Office. Since 2011, the Loans Program Office has generated considerable good will and awareness of the program. It is now widely considered one of the most successful government programs. NDi created LPO monthly E-Newsletter, which outperforms government industry average engagement clicks by over 50%. NDi designed a series of 26 print and web-friendly project posters, which have been featured in numerous press articles and are currently on display in the Deputy Secretary’s office.